POF - Free Online Dating the iOS version of PlentyOfFish, the online dating and friendship website. The website was founded in 2003 and attracts millions of visitors until now . It counts 55 million members and this iOS version is just increasing this number. Several features, quite similar to the Web version are granted to POF iOS users. Search option: POF - Free Online Dating is integrated with a Search option that enables to look for matches and new profiles. Results are instantly showed up in thumbnail mode on the interface. A tap on the profile displays information related to a POF user. Create profile: the bachelor has to be more than 18 years old to be able to join POF. Creating a profile and editing it is feasible on the app's interface. POF - Free Online Dating is given the ability to upload images to add as profile picture. "Locals" and "Meet Me": these two options remain the most frequently used by singles. 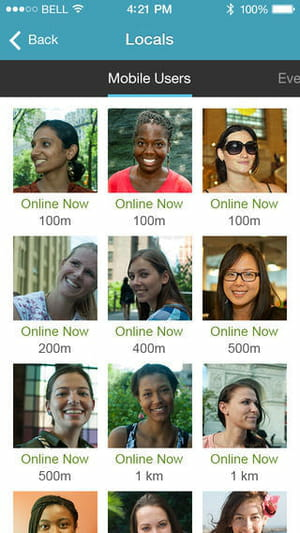 "Locals" displays any POF online members in the surrounding (100m, 500m, 1 km, etc.) thanks to the use of GPS. The user can send a Meet Me request to another user. The latter can accept or not the invitation. Miscellaneous: apart from the features mentioned below, POF - Free Online Dating also features options that let two contacts chat and exchange messages instantly. Notifications let them be aware of singles who have viewed their profiles, incoming messages and all received requests. This application is available in several languages. It can work on iPhone, iPad, iPod touch and is optimized for iPhone 5. An upgrade membership subscriptions are available but paying. Latest update on May 28, 2014 at 09:21 AM.